Her highly-publicised reality show has failed to rouse interest across the UK. 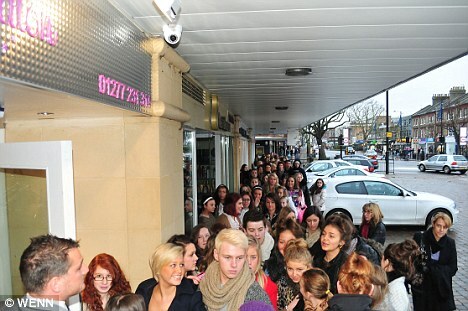 But it appears Amy Childs still has some trusty fans in the place where it all started - Essex. Hundreds of teenagers flocked to her salon in the town of Brentwood where the former The Only way Is Essex star made a special visit to sign, well, pretty much anything for her followers. On the top of the list was her 2012 calendar followed by her tanning products. The queue trailed down the street for the two-hour appearance. Amy defied the cold, dressing festively in a metal-coloured sparkly wrap dress. She paired the tiny number with a pair of gold sparkly boots. The 21-year-old posed inside the salon, which sports mainly purple interior, next to a tiny purple Christmas tree with white and silver decorations. Just drove past Brentwood ! 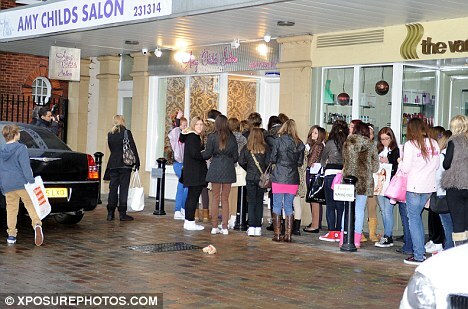 The que outside Amy Childs salon is redic !!! Amy's salon opened last month but the star has barely spent any time there as she films her new reality show, It's All About Amy. It premiered to an audience of about 500,000 but has seen ratings plummet below 300,000 by its third show last week. And it has failed to break Channel 5's top 30 highest rated shows. Amy has said she is confident the ratings will rise. 'The first episode of my show, 'It's All About Amy,' was aired last week,' she wrote in her column for New! magazine. 'I hope you enjoyed it! I saw it for the first time on a cinema screen with new! and other journalists, and I was so nervous! I arrived at the launch in a very Essex outfit - a diamante bikini! I even had a vajazzle! 'I watched the show again with my family - and over half a million people tuned in! I'm really pleased. I know some TV critics will say it's not many, but most reality shows pick up as they go on.